Yay, Apple finally released official battery cases for the iPhone XR and iPhone XS! Boo, they cost $130 each. Seriously, pause for a moment to think about that… $130 for a battery case! Apple always charges a premium for its accessories, but $130 is flat-out obscene. Instead of dumping all that cash on an Apple case, check out these alternatives that cost $30 or less. Oh and they also have bigger batteries that Apple’s new cases so they last longer. The Newdery 5,000 mAh iPhone XR Battery Case is a great option for the iPhone XR, while iPhone XS users should check out the iPosible 6,000 mAh Battery Case for iPhone X/XS. If you have an iPhone XS Max, you should check out this popular Ztesy case that adds 6,000 mAh of juice for only $24. 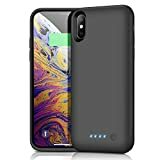 [EXTENDED 100%+ BATTERY LIFE] – Powerful 5000mAh Li-polymer portable charger case can effectively provide 100%+ extra battery life for iPhone XR, the power case supports the lightning port. Premium design for 2018 newly released iPhone XR. [BUILT IN MAGNETIC METAL] – The iPhone XR extended case battery is built in high-quality magnetic metal, compatible with any magnetic car mount holder. Support wireless and wired headphone, It’s a good choice to enjoy music while charging. [CHARGING and DATA-SYNC 2 IN 1] – Sync your iPhone XR to the MacBook, PC or laptop without removing the case charging. Simultaneously charge your iPhone XR and case charger together with the original iPhone lightning cable(charge quicker separately). [360 FULL PROTECTION] – Soft TPU material of lightweight backup cover provide superior full protection to iPhone XR, EXTRA LIPS helps prevent your screen and camera from getting scratched. 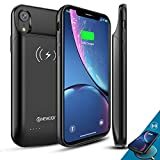 [100% SATISFACTION GUARANTEED] – 12-month warranty with Amazon 30 days full refund guarantee; Lifetime customer support for 5000mAh iPhone XR battery charger. ➤【6500mAh High Capacity Last Longer】:This iPhone X/Xs charging case is 6500mAh high powerful capacity.More than doubles your iPhone’s battery life.And never worried about your iPhone ran out of battery in daily life.It’s Portable charging anytime and anywhere. ➤【Easy to install】:Insert your iPhone X/Xs into the lightning output port,press cellphone into the case,then adjust the soft top,pressing the power button for 3s.The iPhone X/Xs extended charging case uses a lightning input port to enable recharging and data transfer. ➤【Advanced Sync-through TECHNOLOGY】:Amazing sync-through technology that you can simultaneously charge your iPhone and the iPhone X/Xs battery case charger together, Conveniently sync your iPhone to your Macbook, PC or laptop without having to take the battery case off.100% compatible with all iOS versions:Apple Pay, and future iOS software updates(Apple CarPlay is not supported). ➤【Charging & Protection 2 in 1】: The iphone X/Xs battery pack charger case was Charging and Protecting double function,well-made hard case with 360 degree protective bumper design, Protect your iPhone from scratches or other daily wear and tear.The batteries use Grade A+ batteries with CE and RoHS certification.Internal chips also protect your smart phone from overheating, short-circuiting, over charging, and discharging! ➤【24 Month Warranty】: Customer satisfaction is our #1 priority.Purchase with confidence,100% money back guarantee,If you are not satisfied with our iPhone X/Xs battery case,let us know we will guide how to use,we offer full refund or replacement so you Risk Free. More Than 180% Extra Power–ZTESY battery case with powerful 6000mAh capacity for iPhone XS Max helps keep your phone charged the entire day. ONLY FOR 6.5 INCH MODEL. 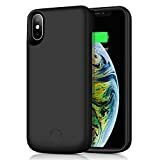 360°scratch-guard–ZTESY High quality battery cases with dual layer to protect your iPhone XS Max from scratches and daily wear and tear.LED indicator will show how much juice is left. 100% compatible with all iOS versions–Approved by Apple to work with all functions of your iPhone XS Max charging case. This battery case has the highest industry regulatory certificates: CE, RoHS, and FCC. 100% safty–Stop wasting your money on cheaply made charging stations which might ruin your phone! This case have fast charger station offers temperature rise, over-current, short circuit, over-voltage, over-load, electromagnetic, electrostatic and electric shock protection! Now, your iPhone XS Max as well as you are safe. 30-DAY MONEY-BACK GUARANTEE–Purchase with confidence! Life-Time ironclad warranty ensures you are protected for the life of this product, enabling you to return the product in case you don’t like your purchase for any reason.